The 619 D.M.S. 2 oz. Mace and Handcuff Case from Aker is an attractive, economic and efficient method to carry the nonlethal tools needed to take in any suspect. A brown, premium leather exterior gives the case a sleek professional look that does not sacrifice functionality. The leather has been custom molded to hug the body of its contents for a snug fit that holds its shape regardless of weather, usage and external conditions. An open top design allows users to quickly retrieve items without wasting time fumbling with unnecessary snaps or having to worry about snags or catches slowing them down. Designed to fit wide range of uniforms types and styles, the D.M.S. utilizes a dual mounting system that accommodates both belts and paddles. Simply use an allen wrench to remove the paddle attachment and thread the holster onto any belt up 1.75-inches wide. Very good product. Comfortable and performs as advertised. 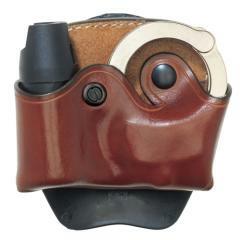 I wish I saw this holster earlier. I showed my buddy and his team is going to start using them. Great for low profile assignments. Good quality, functions as described.